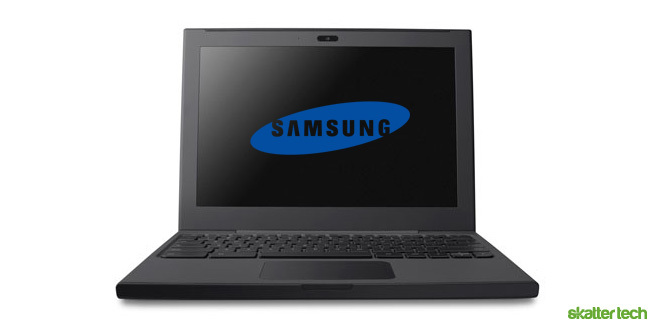 Another Samsung Press Event This Week, New Google Chrome Notebooks Imminent? Samsung is working quite closely with Google this year and it looks as though the pair are about to launch something new this week. The Galaxy Tab 8.9 and 10.1, which made a debut at CTIA Wireless 2011 earlier this year, are just an example of their collaboration. Both those device will to hit store shelves this summer running on Android 3.0 Honeycomb. There is apparently even more news as the Korean company is hosting another event later this week after I/O 2011. While Samsung tablets with Android will definitely make appearances at the conference, Chrome OS might also make news. Google first began offering thousands of unbranded CR-48 notebooks last year to developers, organizations, and students for free. The company was trying to collect usage data and feedback to better understand user habits. Google even launched the Chrome Web Store, which recently just featured the Skatter Tech app on the home page, to provide users with a directory of powerful cloud-based HTML 5 web apps. While Chrome OS probably will not replace a full-fledged computer anytime soon, it could fill all the needs of many who only need to get online for basic tasks such as email. It is entirely possible that Google will sell these notebooks for as little as $150-200, but some rumors indicate that these might ship for free with small $10-20 monthly subscriptions. This business model is entirely different from those of traditional hardware manufacturers and I am particularly excited to see how it plays out.